Plum pox is a plant disease that infects stone fruit trees including peach, nectarine, plum, apricot and cherries. The disease, which is also called Sharka (the Slavic name for plum pox) disease, is caused by the plum pox virus (PPV). It is considered the most serious virus disease of stone fruit trees. Plum pox is spread from tree to tree by aphids and through infected budwood used for grafting, which is the normal method of propagating stone fruit trees. Symptoms of plum pox infection include leaf and fruit yellowing, fruit deformation, and premature fruit drop. A tree suffering from plum pox can go into serious decline, especially if the tree also becomes infected with other viruses. What does plum pox mean to me as a consumer? Presently, plum pox is not an issue for consumers. PPV was first found in the U.S. in 1999 and was subsequently eradicated by destroying the infected and surrounding trees. Tree destruction is the only means of control once trees are infected. The 10-year eradication program cost about $40 million and took out 1,675 acres of trees in Pennsylvania. 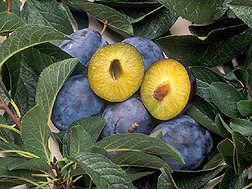 Since Pennsylvania is not a major stone fruit-producing area, the consumer market for fresh and dried plums in the United States was not significantly affected. The concern is that if plum pox becomes widespread in the U.S., the disease could cause a major disruption in the availability of plums, prunes and other stone fruits if no solution to the plum pox problem is available. So to ensure that the U.S. consumer continues to have access to the widest variety of fruit, the Agricultural Research Service (ARS) began a research program to develop plum trees with resistance to PPV. (More information about plum pox outbreaks in the U.S). What is being done to eradicate the PPV infection in the U.S.? PPV has been detected in New York and Michigan and appears to have been eradicated through tree destruction each time it was found as it was in Pennsylvania. In 2006, PPV was reported in one tree in Michigan and in several orchards in New York. In Michigan, the infected tree and all surrounding trees were destroyed, which eliminated the virus. In New York, the virus was found in several orchards and a quarantine and eradication program was undertaken by state and federal agencies. To date, it appears that the virus has been eliminated from the New York locations. For more information about New York state’s plum pox program. PPV also was detected in Canada in 2000. Although an eradication program reduced the incidence of the virus to a very low level, it was not eradicated, and the virus is under a management program. So the disease remains a threat to U.S. stone fruit production. For more information about the Canadian program, see 'Canadian Food Inspection Agency: Plum Pox Virus'. Plum pox virus is spread by aphids. 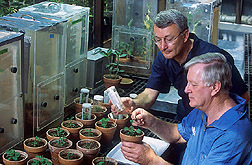 Here, Fred Gildow (left), of Pennsylvania State University, and ARS plant pathologist Vernon Damsteegt set up an experiment to screen aphids for their ability to transmit the destructive virus. Click the image for more information about it. What is the U.S. Department of Agriculture (USDA) doing about plum pox? The Animal and Plant Health Inspection Service (APHIS), an agency of USDA, is responsible for preventing the introduction of plant pathogens into the United States. All fruit nursery stock for importation is tested for a range of known fruit tree pathogens, especially those that are not known to occur in the United States (exotic pathogens). What is ARS doing about plum pox? ARS has an active research program to develop a better understanding of the virus and how mechanisms of resistance may work in trees. The primary goal of the research program is to produce PPV-resistant trees. Because developing a PPV-resistant plum tree is not a simple or quick project, ARS has not waited until plum pox has a major presence in the United States to begin research. Rather, ARS has taken the proactive step of developing a PPV-resistant plum tree and doing the testing required to allow genetically engineered trees to become available, before plum pox precipitates a crisis in this country. How was the PPV-resistant plum developed? There are few sources of natural resistance to PPV in stone fruits and when resistance is present, it may be incomplete and difficult to transfer through conventional breeding to develop new resistant varieties. ARS researchers decided to evaluate the potential for developing strong resistance using genetic engineering. This work was done in the European plum (Prunus domestica). 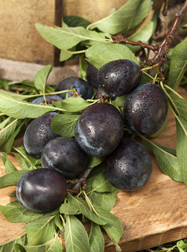 The gene for PPV coat protein was separated from the PPV virus and inserted into the plum DNA, which was then regenerated and grown into complete plum trees. These trees now had the additional gene in their DNA and became resistant to PPV. The new PPV-resistant variety was named HoneySweet. 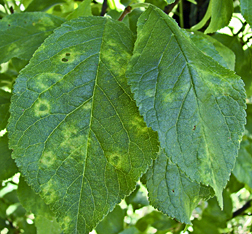 The yellow spots on this leaf are evidence of infection by the Pennsylvania isolate of plum pox virus. Do you know exactly what new genetic material is in HoneySweet? Yes, we know all of the genes that have been added to HoneySweet. The entire genome of HoneySweet has been sequenced and we know the exact location of the gene in the genome of HoneySweet and we know that it is not affecting other HoneySweet genes. Are the added genes in the fruit? Will I be eating foreign genes? The new DNA is in the fruit. But genes are broken by digestive enzymes in the stomach. We have undertaken extensive analyses of the fruit from HoneySweet and compared it with fruit from other plum trees. We have found that there is no significant difference in composition in terms of nutrients typically measured in plums (sugars, acids, vitamins, minerals, fiber, etc.). Can the virus DNA harm people? Plant viruses do not infect animals or people. Thousands of infected trees grow in Europe and the fruit from these trees is eaten by people. There has been no instance of harm from eating the fruit. Also, a portion of all produce, whether from commercial growers or the home garden, is infected by a variety of viruses. Such fruit contains coat protein and coat protein genes from these viruses, and people have always eaten them. In that sense, HoneySweet is no different than many other fruits that contain coat protein genes. Is HoneySweet safe to eat? How do I know that? HoneySweet has been evaluated by the USDA Animal and Plant Health Inspection Service (APHIS), the U.S. Food and Drug Administration (FDA), and the U.S. Environmental Protection Agency (EPA) and was found to be safe for the environment and equivalent to plums currently available to consumers. Plums are a good source of vitamins, minerals and other health-promoting nutrients. How did you show that the HoneySweet trees are resistant to plum pox? Trees were tested in a greenhouse for five years. Plant tissue infected with PPV was grafted onto the HoneySweet trees, and none of the HoneySweet trees developed plum pox disease. Trees were also grown in the Czech Republic, Poland, Romania, and Spain where PPV is now indigenous, and after almost 20 years of testing, the HoneySweet trees have never been infected by transmission through aphids, which are insects that naturally carry the PPV virus from tree to tree. Have HoneySweet trees been grown in orchards in the United States? Two small demonstration orchards have been planted in the United States, but there are currently (2015) no commercial HoneySweet plantings in this country. Could HoneySweet pollinate other trees? HoneySweet will cross pollinate with other European plum trees. HoneySweet pollen can fertilize other European plum trees but not Japanese plums or other stone fruits such as peach or apricot. To find out how far HoneySweet plum pollen will travel to other European plum trees, over 12,000 seeds from non-genetically European plum trees were evaluated over 11 years at distances from 230 feet to more than 3,500 feet from a HoneySweet planting. Only 39 of the more than 12,000 seeds were found to have received HoneySweet pollen and most were from the trees closest to the HoneySweet planting. These results showed that plantings of HoneySweet plum can coexist with plantings of non-genetically engineered plums. (More information about pollination and crossbreeding). 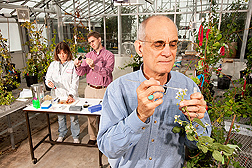 ARS horticulturist Ralph Scorza pollinates plum flowers as part of green house studies. Click the image for more information about it. Have APHIS, EPA and FDA approved the release of HoneySweet? After seven years of evaluating the data that USDA researchers submitted to the three U.S. regulatory agencies responsible for overseeing genetically engineered plants, HoneySweet has been deregulated by APHIS, FDA reviewed HoneySweet and had no questions about the fruit's safety and wholesomeness, and EPA registered HoneySweet based on its safety and effective resistance to PPV. Am I likely to see HoneySweet plums in my grocery store soon? People are not likely to see these plums and prunes in stores anytime in the near future. Plum pox is currently eradicated in the United States. But as with most foreign diseases, there is the potential that plum pox will become established in this country, and all of our current plum tree varieties are susceptible. Since it takes years to develop and multiply new varieties, we can't wait until the problem becomes endemic to do the research to have resistant trees. USDA needs to be ready before the problem becomes a crisis. Is ARS consulting with plum growers and the nursery industry about the planned release of a genetically engineered (GE) plum? ARS research horticulturalist Ralph Scorza and his USDA colleagues maintain contact and dialog with growers and fruit industry groups so that there is a flow of information on PPV, HoneySweet, and the needs of the growers as they continue to provide safe and wholesome fruit and fruit products to consumers. Information has been supplied to consumers through popular press articles, lectures and other outreach activities. Where can I get more information about HoneySweet development and ARS plum pox research? Contact Kim Kaplan, ARS Information Staff, 301-504-1637, Kim.Kaplan@ars.usda.gov.